This intensive deep cleansing treatment uses the latest technology to dissolve skin congestion, unclogging pores to achieve smooth, clear and clean skin. Ideal for teenage oily and problem skins that experience blackheads and breakouts. Harnessing the deeply cleansing power of Galvanic desincrustation, a process that softens and emulsifies sebum, our skins natural oil and keratin lodged in the follicle. Performed prior to manual extractions, desincrustation prepares the skin for safe, painless and successful removal of blackheads and micro-comedones by softening and liquefying sebum, which in turn facilitates the easier release of even the most resistant blackheads. 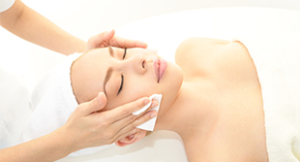 It is the deepest way to clean the skin and remove pimple causing congestion. Direct High Frequency is applied to the skin post extractions for its germicidal effect. For best results a course of approximately six treatments, ideally performed once a week for oily, acne and teen skin should be performed. To maintain results a treatment once every 3-4 weeks may be required along with some lifestyle and dietary changes with the recommended home care program. Glavanic desincrustation along with specially chosen actives work to bring back skin health to problematic and oily teen skin, helping to reduce not only breakouts and redness within the skin but is also beneficial for excessively oily skin and for the removal of blackheads.